Where can I find good bodyweight training plans, Todd? You can find simple, good and free bodyweight training plans online. To make life easier for you, I decided to write this article where you are going to find a list of the 30 best bodyweight training plans that I have found online. In my search for good bodyweight plans, I found out that most of the programs are hybrid and do not focus on one quality only. You are going to lose fat and build muscle regardless of which category the routine belongs. However, you should know that the strength training plans are better for muscle mass while the conditioning circuits are better for losing fat. If you’re willing to make in investment in a bodyweight exercise program, you can do it here. With that said… let’s start! In this section belong all the programs that their main target is to become stronger or to build a stronger foundation. Since it is required to do lots of reps as a beginner to build a solid foundation, some of the programs here might seem that they fall into the endurance category, if we judge them by their parameters. However, I have included them in the strength category because endurance isn’t their goal. This is a very simple and easy plan to follow designed specifically for total beginners. By following this plan, you will be able to increase your reps in some of the basic bodyweight movements. If you can’t do regular push ups (or any other exercise), you can use an easier progression and then test your abilities again at the end of the 31 days. You can follow multiple monthly cycles of this plan until you are able to train with some of the more advanced training plans that you can find later in this post. This plan is also for beginners, however, you should have a solid foundation already built before starting this plan. With this plan, you are going to train 3 times per week. If you are interested in achieving gymnastic skills later on, this plan might be one of the best options you have. A specific deload principle isn’t stated directly in the post. I would recommend you to follow monthly cycles by having a deload week every 4th or 5th week. This is a great plan for total beginners. Even if you are not able to do a single push up, if you follow this plan you are going to achieve it. This plan is designed so that you are going to gradually move to more advanced movements and thus be able to master the basics (push ups, pull ups, squats) and build a very solid foundation. This is a very straight forward training plan. The main goal is to build strength. This program isn’t only for beginners and if you find that it works well for you, you can follow it as you become more advanced too. Another benefit of this program is that it doesn’t require a lot of time commitment. Deloading is built into the program by cycling through easy, medium and hard workout sessions. Even if this plan is titled as a beginner workout, by a bar-barian member, I believe that it’s better suited for intermediate athletes. To follow this plan you should have already mastered some hard moves that are definitely not on the beginner level (e.g. wall assisted handstand push ups). This is a split type program. Meaning that you are going to have days dedicated to different areas of your body. Lastly, if building muscle is one of your priorities, then I would suggest you to give this plan a try. This is a very simple and straightforward plan with the main goal being to get stronger by achieving harder and harder calisthenics movements. In this plan, you are training mostly for strength. However, the short breaks and the higher progression standard are going to help you build a ton of muscle and lose fat at the same time. With this program, you are going to train all the basic movement patterns by progressing in exercises like push ups, pull ups, handstand push ups, pistol squats, leg raises, etc. This is a routine that you can follow for a long time and still get stronger and stronger. If you want to achieve both regular advanced calisthenics and gymnastic skills as well, this may be the best available free plan online. It doesn’t say it on the post, but you can have 2 cycles per week with one rest day. This way you can organize the plan in weeks. This plan can be followed by beginners as well, but it might be difficult to understand some of the concepts presented in the article. If you are a newbie, I would recommend that you get familiar with gymnastics by following bodyweight plan #2 and when it becomes easy, you can progress to this one. This is another split routine where you are going to have days dedicate to different muscle groups. This plan is mostly focused on building muscle rather than strength. This is a 6-month training program that aims at getting you stronger. Following this program is also going to help you build a lot of muscle. The first months are relatively easy (depending on your level), but as you move on it becomes really challenging. If you are able to go through this program successfully you will be seriously strong afterward. Both physically and mentally. This is a very advanced personalized training routine. I wouldn’t expect you to follow this program. So why did you include it, Todd? Even if you can’t follow the routine Jim follows, you can get a lot of value by reading how his routine is structured and why his doing it that way. Jim is a very advanced calisthenics athlete and you can learn a lot by studying his training routine. This is a 4-week training plan with the sole purpose of helping you achieving the muscle up on rings. This is not a complete plan, meaning that you will still have to add some leg and core work to balance it out. If you have access to ring and you want to achieve a clean muscle up, this is a great plan to follow. 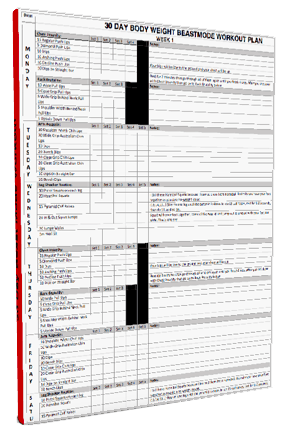 This is a very well designed gymnastics training plan. This plan isn’t only focused on strength, but rather you are going to practice a lot of skill work and flexibility drills as well. This is a 12-week program. Here you are going to find the bodyweight plans that are focused towards strength endurance and conditioning. 30 Days of Change program is designed to change your exercise habits as well as the way you look and feel – in a month. It is completely 100% equipment free. Different daily programs will ensure that your body doesn’t adapt to the same routine so you’ll see progress a lot sooner than with any other program. This program puts a lot of emphasis in aerobic and anaerobic conditioning along with endurance. Even if I put this program in the beginner section, different progressions are offered so that you can apply this program even if you are an intermediate level athlete. This is for anyone who wants to lose the most amount of body fat possible, but has no access to a gym or equipment. Other than helping you losing weight this 30 day routine is going to help you increase both your endurance and anaerobic conditioning. This is a hybrid workout plan that is going to help you increase your maximal strength, your endurance and conditioning. You are also going to burn fat and build muscle as well. This is a monthly plan where you are going to train 3 times per week alternating between workout A and workout B having a rest day in between. After you have finished a full month you should take a week off and then start the next month training with the same or the more advanced variations. This plan is for people that are still on the basic level and want to build all around strength and become more efficient in bodyweight movements. If you are a total beginner, then this plan is not yet for you as it requires some basic movements to be already mastered. This plan is for people who have mastered the basics and want to reach the next level in conditioning and endurance. If you want to lose fat, this is a very good program to follow. The plan is 6 weeks long. In the first 4 weeks you are going to train 4 times per week and during the last two 5 times per week. Since this program requires little time commitment, if you don’t have much time available this is a great plan to follow. Bodyweight Plan #17: Full Body Weight Workout Routines, NO GYM? NO EXCUSES! This plan is designed in a way that it’s easily implementable for all level of fitness. If you decide to follow this routine, you will have to train 6 times per week and take a break at the 7th day. The program is designed in weekly cycles. After the end of each week, if the week was easy for you, you can progress to the next level. You can use every 4th or 5th week as a deload week too. This is a very simple plan aimed mostly at beginners. To follow this plan you should not be a complete beginner, but have some fair amount of training already (e.g. 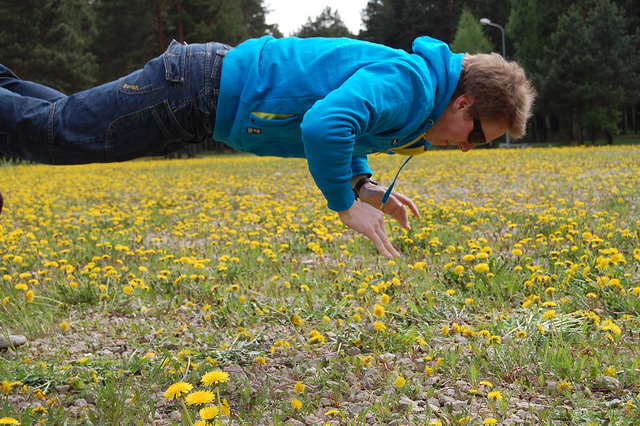 being able to do 10-15 push ups). This is a very simple 4 week bodyweight workout plan. There are two main workouts consisting of AMRAP type circuits, which you are going to alternate every other day. This plan is for people that are at the beginner-intermediate level and not complete beginners. This is a 4-week bodyweight program that consists mainly of bodyweight circuits and HIIT type workouts. Following this routine is going to help you lose a lot of fat. You should already have a solid bodyweight strength foundation before attempting to follow this routine. 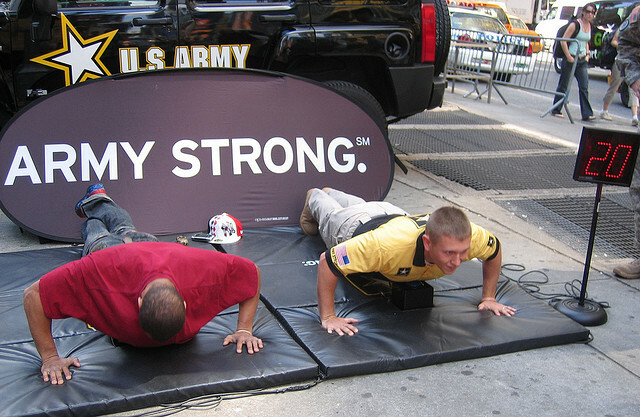 As the name suggests the whole purpose of this routine is to reach 100 consecutive push ups. Day 1: Achieve the desired rep number using the least sets possible. Day 2: Achieve the desired rep number spreading the sets through the day. Even if you don’t have this specific goal in mind, this plan can help you build a lot of endurance. This plan is not complete by itself, meaning that you will have to include other exercises into the mix or adapt your current program around the 3 day cycle. If you train with this program, I recommend you to include lots of pulling exercises to balance out the patterns and have some leg and core exercises as well. This is a crazy routine to follow. Kind of similar to the 100 push up plan (#1) but way more brutal (depending on your goal). Even if the main purpose of the plan is to increase the total number of pull ups you can do in an day, it will also help you increase the number of pull ups you can do in a row. This plan is for intermediate and advanced athletes that are able to do at least 10 consecutive pull ups. In the routine, a deload phase isn’t stated, but I would recommend that you have one every 4th or 5th week to recover properly. Similarly to the previous plan (#21), this isn’t a complete routine and you should include some other exercises into your training. This is an excellent 30 days program that you can easily introduce into your current routine if you want to take a break from pure strength training and move a little more into endurance and conditioning. 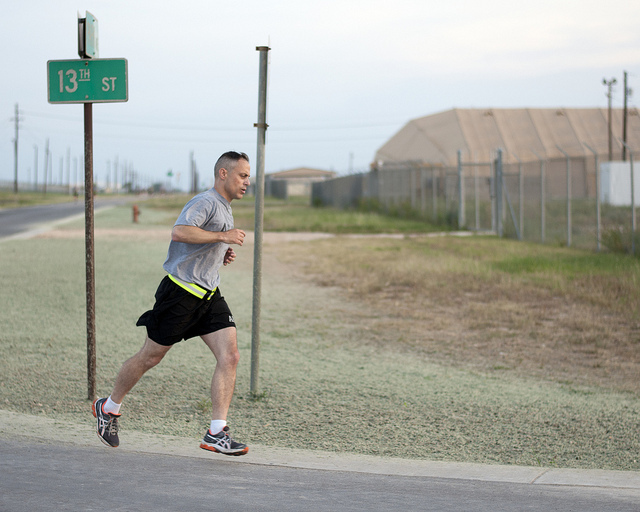 With this plan, you are going to target both aerobic and anaerobic conditioning. After the 30 days, you can return back to strength training or keep using this program. This program is for advanced athletes. It is a 12 week routine, where you will have to train 5 day per week having 2 consecutive days for rest. This plan, consists mostly of high rep bodyweight circuits. Because the reps required by the plan are pretty high, this plan is mostly aimed at advanced athletes who already have developed great strength endurance but still want to reach a higher level. 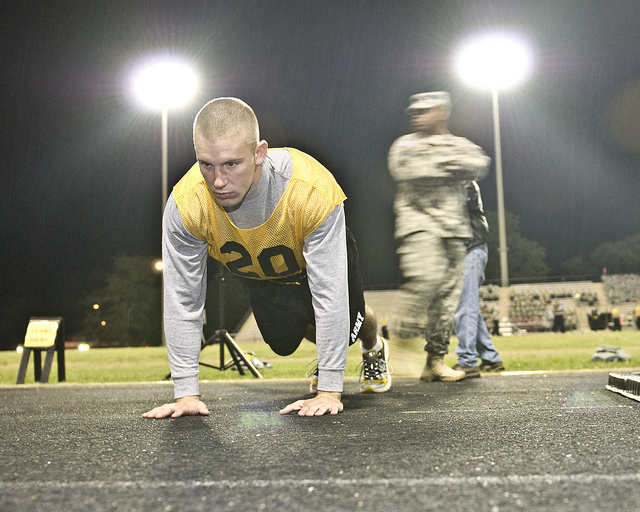 This plan is designed for advanced athletes who have plenty work capacity. This routine contains swimming as an exercise, so if you want to follow this plan fully, you will need access to water. Lastly, this program contains lots of running. The main focus of the program is on building endurance. There are a lot of different routines shared in the post. This makes the plan more flexible and you will be less likely to get bored. In addition, some of the routines will help you build more muscle as well. With this routine, you are going to train 3 times per week. The sessions are mostly Tabata circuits and other type of circuit training. For this reason, this plan is mostly targeted towards conditioning. Training with this program is going to help you lose a ton of fat. Also, most of the workouts require little time commitment and as such this maybe be a good option if you have a busy schedule. This is a plan that I have recently created. In the first 2 months, you are going to train 3 times per week. In the last one, you are going to train 4 times per week. No equipment is needed for this training routine. This workout plan is aimed mostly at women. All of the workout sessions of this plan are focused on the glutes. This is not a complete program and as such you will have to add more exercises into the program to balance it out. Similarly to the previous one this program is mostly aimed towards women. The workout sessions are really short and easy to implement in top of another routine. This is not a complete program. Make sure to add other body part training into this one. All of these workout plans are available to you for free! If equipment and resources used to be an excuse for you, now they no longer are. With the Program Guide and this list, you have everything you need to start working towards your fitness goals. Which of the training plans fit best to your current training goals? I would love to hear your answer in the comment section bellow! Fantastic compendium! Thanks for assembling all of these resources. It relies on only pull ups, pushups, and bw squats, done three times a week. The part that I enjoyed was how the third routine of the week served as a gauge that determined how you progress the next week. Thanks for including us! Great information! Just what I was looking for; I want to do bodyweight workouts, but I need structure, and a structure/workout plan I can believe in (i.e. that makes sense to me). This list is exactly what I need to get going systematically; thank you very much. Great work Todd Kulslikis.. This is information going to help me and others lot .